The range of available styles and options make choosing a new toilet seat a little more challenging than it used to be, but the actual task of replacement couldn't be easier. Here's what to do. Quiet closing: Gone are the days of toilet seats’ banging closed. Select a product with hinges designed to let the seat down gently. Molded bumpers: The simple, no-nonsense advantage of molded-in-place bumpers? They do not break in the course of regular use. Colors: Toilet seats now come in dozens of colors. One manufacturer, Bemis, offers a color selector tool to help homeowners navigate the field of available options. Cleaning: The better the seat, the easier it is to remove for cleaning. Find a product that can be taken off with nothing more than a screwdriver. Durability: Choose a toilet seat with stainless steel or zinc-plated hinge posts, which neither snap nor corrode as they hold the toilet seat in place. Versatility: For kids, there are “trainer” models that have built-in, removable potty seats; for senior citizens, some toilet seat models feature side arms with slip-resistant grips. Different toilet seats require slightly different methods of installation. Consult the manufacturer’s instructions to understand the quirks and idiosyncrasies of the product you have chosen. One thing is certain: Today’s toilets seats are so easy to install that removing the old one is likely to be the most difficult step in the process. If your existing toilet seat fastens to the bowl by means of metal hardware, the dampness and humidity of the bathroom may have corroded the hinges, making the nuts tough to remove. If so, spray each nut with a penetrating oil, such as WD-40, then wait 10 minutes and try again. Once you’ve succeeded in removing the old toilet seat, proceed to install the new one. Few tools are required, because more often than not, it’s a simple matter of nuts and bolts. 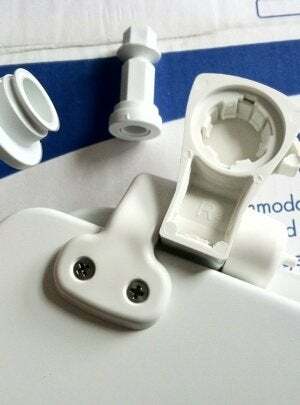 Slide the bolt through the appropriate holes in the toilet seat and bowl. Then, with an adjustable wrench, apply torque to the nut situated beneath the bowl. The larger or more elongated the nut, the easier your job is going to be. Some toilet seat replacement kits may require the use of a tool specially designed for tight spaces.